Yoga is an ancient form of exercise that focuses on strength, flexibility and breathing to boost physical and mental wellbeing. The main components of yoga are postures (a series of movements designed to increase strength and flexibility) and breathing. The practice originated in India about 5,000 years ago. Studies suggest yoga is a safe and effective way to increase physical activity, especially strength, flexibility and balance. There's some evidence that regular yoga practice is beneficial for people with high blood pressure, heart disease, aches and pains – including lower back pain – depression and stress. 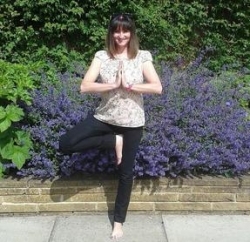 Janet Treble - Janet is a Yoga Alliance registered yoga teacher. Yoga is her passion, and she currently teaches Hatha yoga classes in both Selby and York with an all inclusive approach. Her aim is to make yoga available for all, including complete beginners, and no matter what age, size or ability you have, Yoga has something for everyone! Come along and experience how a regular yoga practice can have huge benefits, both physically and mentally, helping to calm the mind, strengthen the body, improve flexibility and reduce stress. THURSDAY MORNING CLASS COMING IN MAY. CONTACT RECEPTION TO REGISTER YOUR INTEREST. As with all exercise classes please ensure you have the right level of mobility and fitness to try Yoga. Yoga will require you to balance, move, bend, stretch, sit, lay, kneel and stand for periods of time. Please also avoid eating heavy meals before class, wear casual loose clothing for added comfort and to aid mobility, and bring a drink with you in case you become thirsty and need to rehydrate! We want you to get the most out of each session!